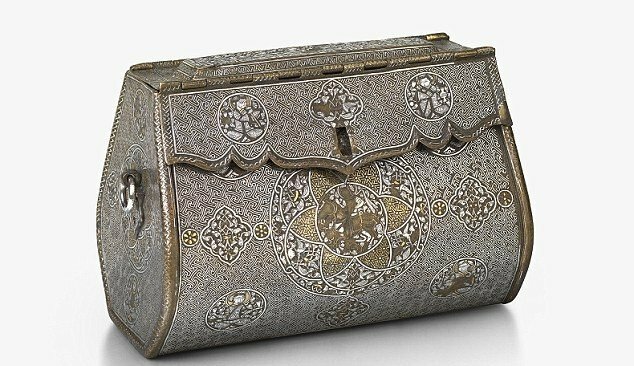 This handbag (or shoulder bag) was made in the Iraqi city of Mosul between 1300 and 1330. It is a brass container inlaid with intricate scenes of courtly life in gold and silver, and likely belonged to a high-ranking female member of the Ilkhanid Court. This hand bag is part of the ‘Court and Craft: A Masterpiece from Northern Iraq’ exhibition now underway at the Courtauld Gallery in London. It focuses on the art and craftwork made in the area around Mosul during the rule of the Ilkhanids – Mongol forces under the leadership of Hulagu Khan that conquered much of the Middle East in the mid-thirteenth century. The Ilkhanids were enthusiastic patrons of art and architecture and their cosmopolitan court, which was peripatetic in nature, was furnished with luxury objects from around the world: porcelains and lacquer from China, silverwares and silks from Central Asia, enamelled glass from Syria. Mosul was the great trading city of northern Iraq. It was ethnically and culturally diverse with Arabs, Iranians, Kurds, Turks, Christians, Jews and Muslims, all represented in the city, where various luxuries, including silks and muslins, and inlaid brass, were manufactured. The ‘Court and Craft: A Masterpiece from Northern Iraq’ exhibition runs until May 18th. Click here to visit the Courtauld Gallery website for more details.